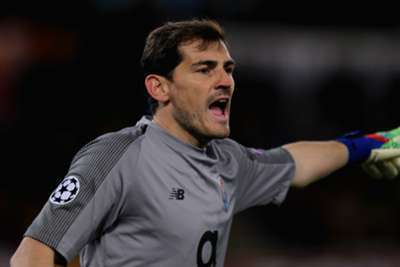 Iker Casillas said he hopes to end his career at Porto after signing a new two-year contract that will keep him at the club until the age of 40. The Spain great is in his fourth season at Estadio do Dragao, where he has won the Primeira Liga and Portuguese Super Cup since his arrival from Real Madrid in July 2015. The 37-year-old picked out the 1-0 victory over Benfica at Estadio da Luz in April 2018 as his most memorable moment in a Porto shirt as he thanked the club for exceeding the expectations he had for the latter part of his playing days. "Today is a very special day," he told the club's official website after Wednesday's contract announcement. "I feel at home in this club. "When they gave me the chance to renew, I did not hesitate. My commitment is with the club, with the city, with the president and my fellow team-mates. "I want to stay here until I finish my career as a footballer. "I have great memories of great matches for Porto. The victory in Luz last season, by the way it was achieved, is perhaps the one that had the biggest mark on me. "When I came here, many thought it would be to play a year or two and finish. I have only words of gratitude to this club - not only to the club, but to the city itself." Porto president Jorge Nuno Pinto da Costa described Casillas as "a world football figure" and said the 2010 World Cup winner continues the club's tradition of goalkeeping excellence. "Porto has always had great goalkeepers," he said. "Iker Casillas is in line with the extraordinary goalkeepers Porto has always had and we are sure that we will always continue with great goalkeepers."